Every Halloween for the past six years, Ralph’s Rock Diner in Worcester, Mass., hosts a three-night series of cover sets and tributes by mostly local bands dressing the part and performing songs by their favorite artists and influences. If you’re in the New England area, you should definitely check it out, but I digress. Shameless plug aside, I mention the Halloween cover sets because one of the past performances consisted of a Manilla Road set that featured most of Crystal Logic. I mention this because I thought it was the closest I would ever get to seeing Manilla Road live. However, that all changed on Oct. 22, when Metal New England brought the epic metal masters, who are celebrating their 40th anniversary as a band, to New England via the Jewel Music Venue in Manchester, N.H. Less than a 2-hour drive from Rhode Island, it was a no-brainer I would be in attendance. This was my first time at the Jewel, which is a decent-sized music venue right off the highway in Manchester. The large room features a centrally located bar, merch space along the sides and back of the room, a designated smoking spot outside and an elevated stage. Perhaps the best aspect of the venue is the sound. It was excellent all night, openers and headliner alike. Enough of the pleasantries. Tonight’s stacked bill of local talent began with Boston quintet Oxblood Forge. This was the only opening band I was not familiar with, but it didn’t take long to bang along to their stoner, groove-laden sound. Highlighted by heavy riffs and crunchy grooves, the band was tight and locked in, despite featuring vocalist Ken MacKay’s brother as a fill-in drummer. 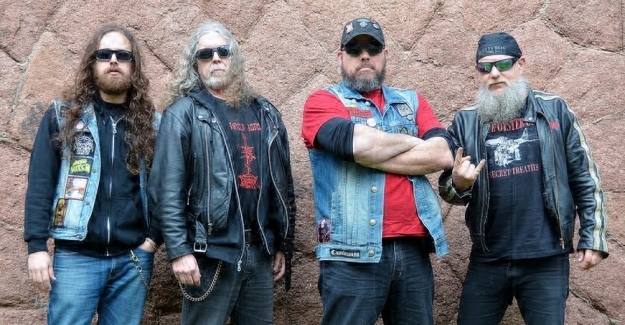 Equal parts Down, Clutch and Corrosion of Conformity, Oxblood Forge injects just enough rock ‘n’ roll swagger to their sound to keep things lively and heads banging. It was a great way to kick off the evening’s festivities. Ken said the band is working on new music, so keep an eye out. Next up were the speed freaks and thrash maniacs of Grave Knight, from Keene, N.H. I’ve seen Grave Knight a few times and they never fail to deliver a fast, raucous, energetic set, and that’s just what we got. If you were to take the riffs of vintage Metallica and the twin melodies of Maiden and Priest, that will give you an idea of Grave Knight’s sound. While the riffs are fast ‘n’ heavy, supported by a pummeling rhythm section in bassist Leonard Trombly and drummer Graham Fortier, guitarists Justin Elbourn and Will Abdelnour balance things out nicely with harmonizing melodies underneath. As if that weren’t enough, there are loads of solos that surely brought out the air guitars and flying fingers. Grave Knight closed their blistering set with a cover of “Between the Hammer and the Anvil,” in which vocalist Jaimes Friedman extended the microphone into the audience for the chorus. Playing as direct support tonight to Manilla Road was Manchester’s own Reckless Force. I’ve seen the band a number of times over the years, but I had never seen them on their home turf. The band has fast become one of my favorites in the New England metal scene, but on this night they were on another level from anything I’d seen before. Twin guitar harmonies and galloping rhythms are the name of the game with Reckless Force and their New Wave of British Heavy Metal-influenced traditional metal sound. Paul Lennon’s driving bass rhythms pair well with the melodies from lead guitarist Greg Hoyt and guitarist/vocalist Sam Pfeiffer, which are so catchy, they make you want to sing along even if you don’t know the words. The crowd was treated to hard-hitting classics (“Full Speed Assault”), mid-tempo rockers (“Fiend from Hell”) and epics (“Warrior’s Fate”) as well as a brand-new song, “The Prophet,” which saw Pfeiffer and drummer Dylan Lee trading off vocal duties in the verses. Hair was flying, heads were banging and fists were raised throughout Reckless Force’s commanding set. With the melodies of Reckless Force ringing in our ears, it was time for Manilla Road to take us on a journey chronicling 40 years of true heavy metal. Mark “The Shark” Shelton and the boys were in good spirits, cracking jokes and engaging in entertaining banter between songs, while delivering a career-spanning performance of fan favorites, newer songs and old classics. The band opened with “Flaming Metal Systems” and “Open the Gates” before unleashing “Masque of the Red Death by the Hammer of the Witches Brew,” which of course featured “Masque of the Red Death,” “Death by the Hammer,” “Hammer of the Witches” and “Witches Brew.” New bassist Phil Ross fit in well with Shelton, vocalist Bryan Patrick and drummer Neudi Neuderth. Since the band is not only celebrating 40 years of existence, but also 30 years of the Mystification album, we got the title cut as well as the title cut from the new album, “To Kill a King,” a 10-minute epic where Patrick spent his “union break” walking through the crowd and taking pictures with fans. “Road of Kings,” “The Ninth Wave,” “Divine Victim” and “Cage of Mirrors” were all aired to great applause and loud cheers. Patrick said the band hadn’t expected such an enthusiastic response from the crowd in New Hampshire, and on a Sunday night no less. The band closed the set with a number of selections from the classic Crystal Logic, including the title track, “Necropolis,” “The Ram” and “The Veils of Negative Existence.” Fortunately, there was time for a couple more before Manilla Road left the stage, with “The Riddle Master” and “Heavy Metal to the World,” which saw Shelton egging on Neudi to play faster and inviting the crowd to do the same. Forty years in to their storied career, Manilla Road not only continue to release quality new music, but the band still clearly has the chops to deliver an over-the-top heavy metal performance that won’t soon be forgotten. One for the ages, indeed.